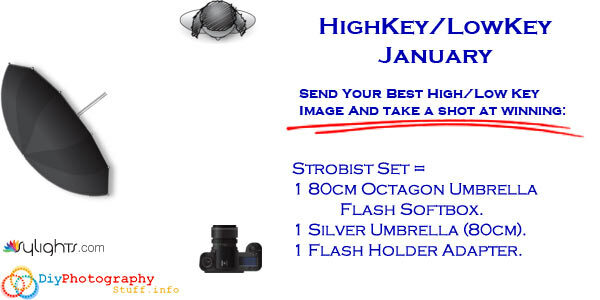 send us your best high/low key image and try win you strobist kit! We had two challenges over, adn now its time for a fresh one. We decided this month topic to be HeyKey/LowKey images, so lets start the fun. To post your images , all you need to do is to go down to the comments section below put some words about how you took the image (camera used, some general settings and if there is some story behind the secenes) and upload your image .Really that simple!!! Its nice if you uppload more than one image, but upload your best one first! How to post images to our monthly challenges in case you didn’t het it yet `-) . PLS share this page, we want to make this monthly competition bigger! Hard direct light on the model back, and small snot on the front of the here. Picked the flower and put it in front of a white backround, changed some brightnes settings. Camera – NIKON D90: Lens – 50.0 mm f/1.8: 0.4 sec at f/8 on Manual. Main flash reflected in umbrella with slave flash behind subjects to light up the background (White wall). Two lights into umbrelas right and left sides. Canon 60D, 50mm f/1.8 lens, tabletop 5500K lights, tabletop photo tent, 580EX II mounted on camera. ISO 100, f/4, 1/30 sec. TNX for posting, there is a winner (http://www.diyphotographystuff.info/3121/jannuarys-photography-challenge-winner-is/) for Jan’s challenge. We are taking a month off, but there will be more in the future!